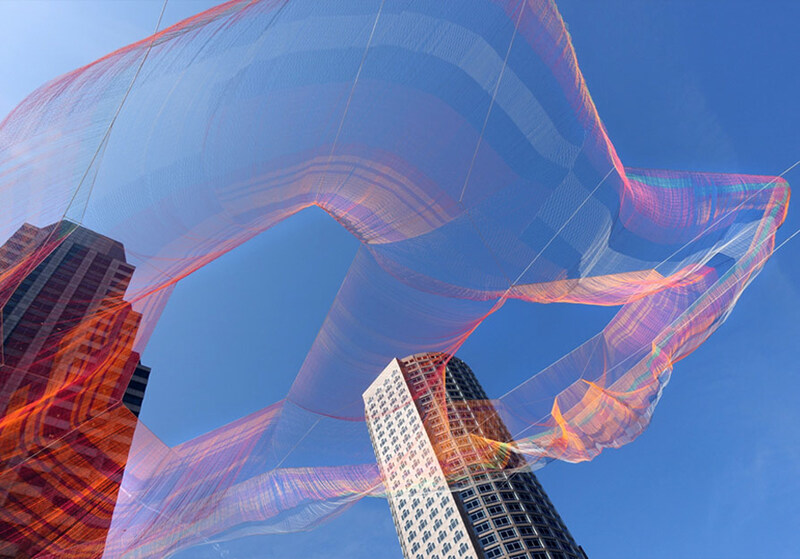 Suspended over Boston’s Rose Kennedy Greenway is a rather fascinating sculpture constructed from over 100 miles of twine. 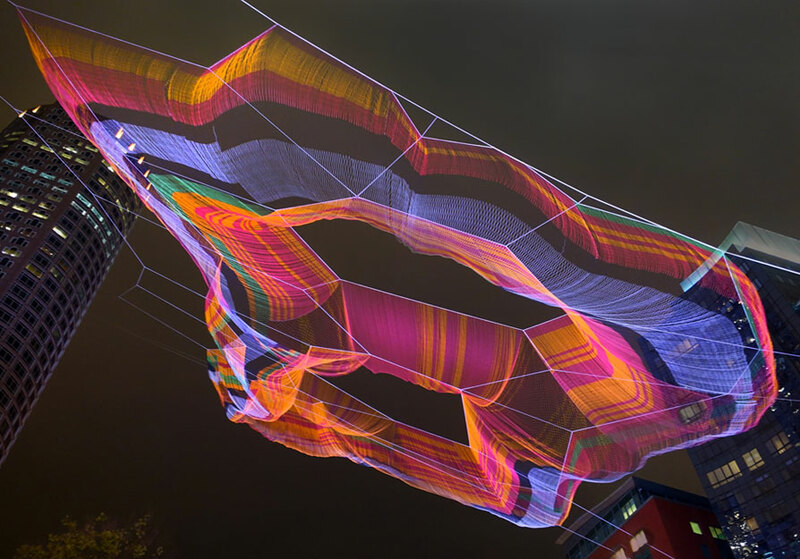 Janet Echelman's piece soars 600 feet above the park and moves gently in the wind. In this view you can see how it flows gracefully within its environment, as if it is a living and breathing work of art. Entitled “As If It Were Already Here”, it's shape and structure echo the history of its location. The three large empty holes in the structure represent the “Tri-Mountain” which was razed in the 18th-century to create land from the harbor. The colored banding is a nod to the six traffic lanes that once overwhelmed the neighborhood, before the Big Dig buried them and enabled the space to be reclaimed for urban pedestrian life. 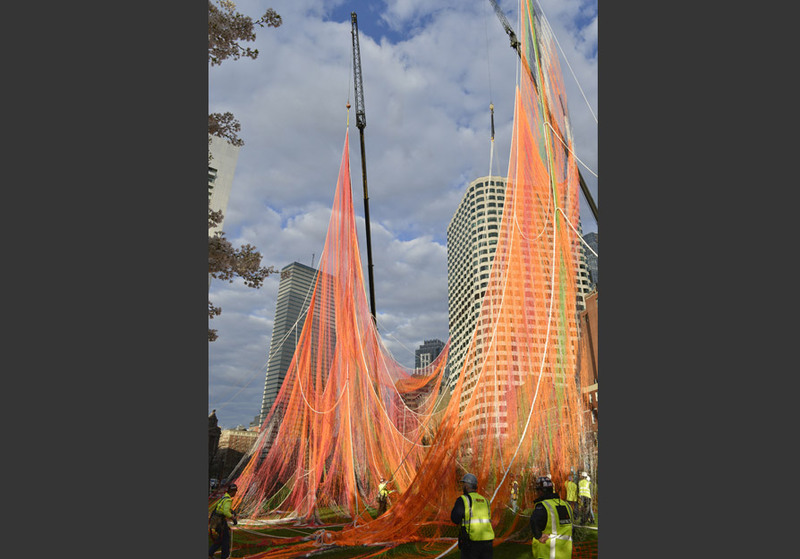 The fluid structure is made by hand-splicing rope and knotting twine into an interconnected mesh of more than a half-million nodes. 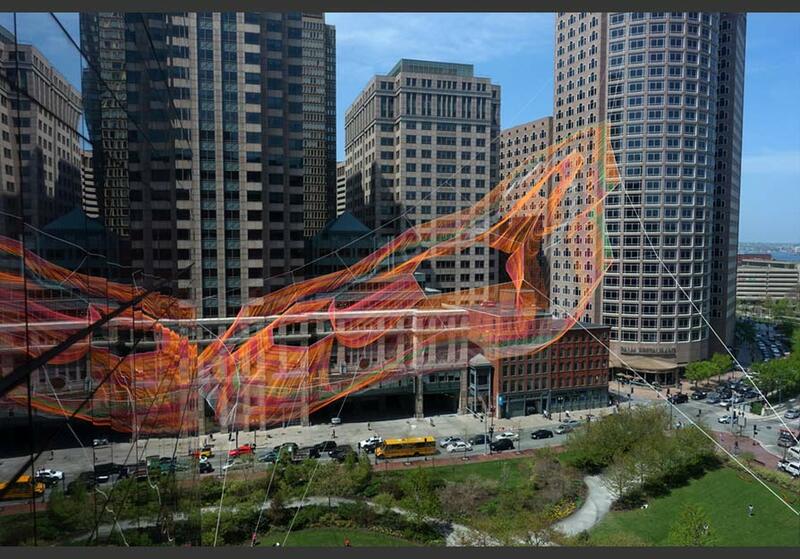 Though the rope structure is incredibly strong, it appears to be as "delicate as lace," floating above the Greenway's traffic and pedestrian park. To be installed on site several roads were closed off, as cranes were required to hang the piece on cables that were suspended from surrounding buildings. This time-lapse shows how it was installed above the park. 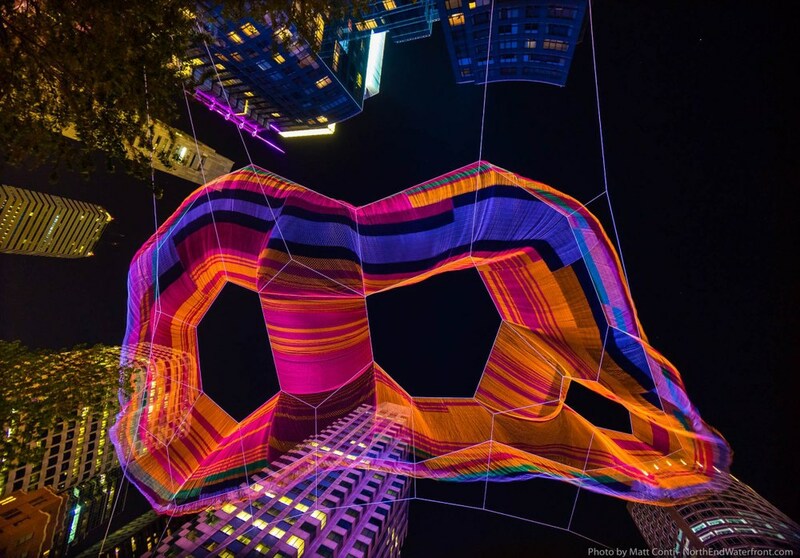 During the day, the 'fish-net' like structure casts a network of shadows above the park and at night, it is lit up in a very intelligent way. The artwork incorporates dynamic light elements which reflect the changing effects of wind. Sensors around the site register fiber movement and tension and this data directs the color of light projected onto the sculpture’s surface. I love how the giant sculpture flows through the wind creating a calm sense of movement. Its impressive form looks mesmerising when illuminated a night and it breathes with the wind. Echelon has created a series of fascinating installations across the globe made with a similar technique. View all of her work on her website.